Chocolate peanut butter fat bombs are easy to make, satisfying and delicious! Perfect sugar-free treats for low carb and keto diet followers. A few years ago I shared my favorite edible chocolate bag for Valentine’s Day, and I have to say that it’s always a hit at parties. Now with so many people limiting their sugar intake, that same bag can be made sugar-free by using a low or no-sugar chocolate chips like Lily’s sweets. 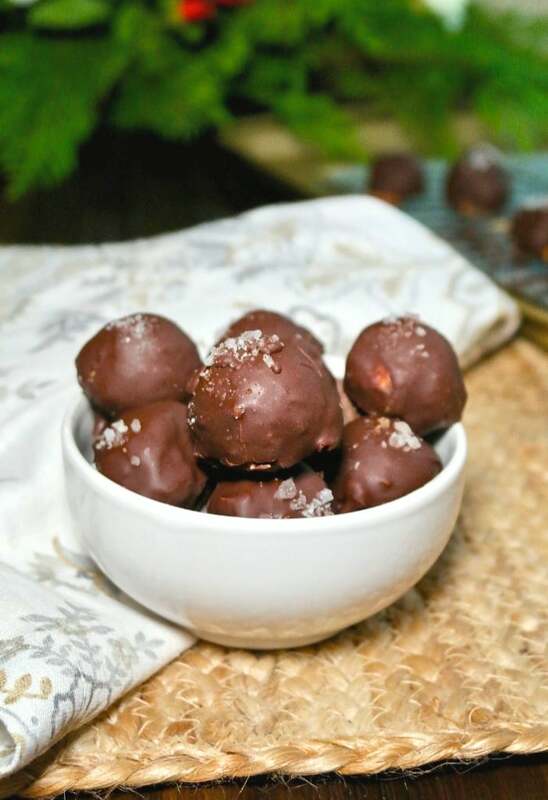 Can you imagine that pretty chocolate centerpiece made into a keto friendly masterpiece billowing with these chocolate peanut butter fat bombs?! Heck, yeah! First, you might ask, what the heck are fat bombs? 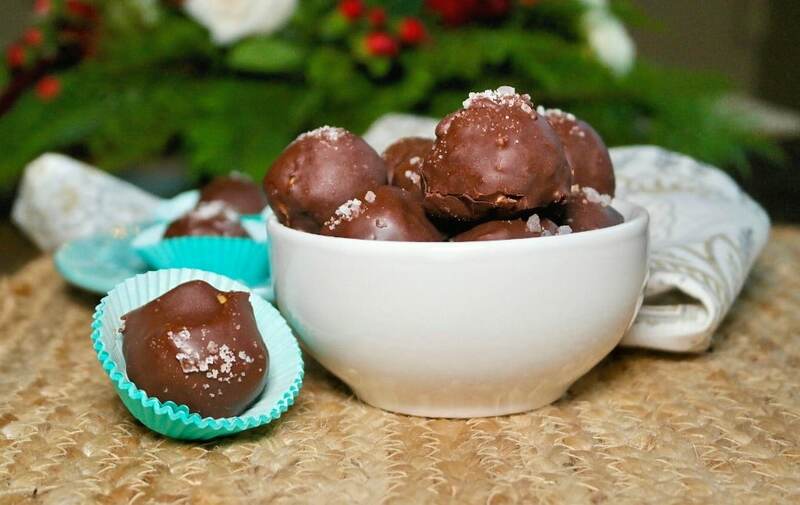 The cliff notes explanation is that fat bombs are treats made with healthy fats like avocado, peanut butter, butter, chia, dark chocolate to name a few ingredients. Wait! For years brands have conditioned us to stay away from fats, which lead us to grab low-fat products, right? Well, the message that we’ve been told, “all fat is bad” is NOT true. Guess what? When we add real fats in our diet, the fat will fill us up providing satiety, so we may not eat as much. What are keto fat bombs? When following a ketogenic diet, fat intake is slightly higher than your protein intake. These babies will help you boost up your fat intake in a delicious way! Are you familiar with protein balls? Protein balls are popular treats to have on hand made with soy or whey protein powder or natural proteins like peanut butter. The difference between a fat bomb and energy balls or protein bites is that you will find more carbohydrate ingredients like oatmeal in the snack along with the protein. The steps to make these creamy fat bombs are super simple and there is a bonus! No baking is required to make theses treats! Let’s make these fat bombs! Blend together butter, peanut butter, and sweetener (monk fruit, stevia or a mix of stevia and erythritol). Roll in 1-inch balls and place on a parchment lined baking sheet. Freeze. 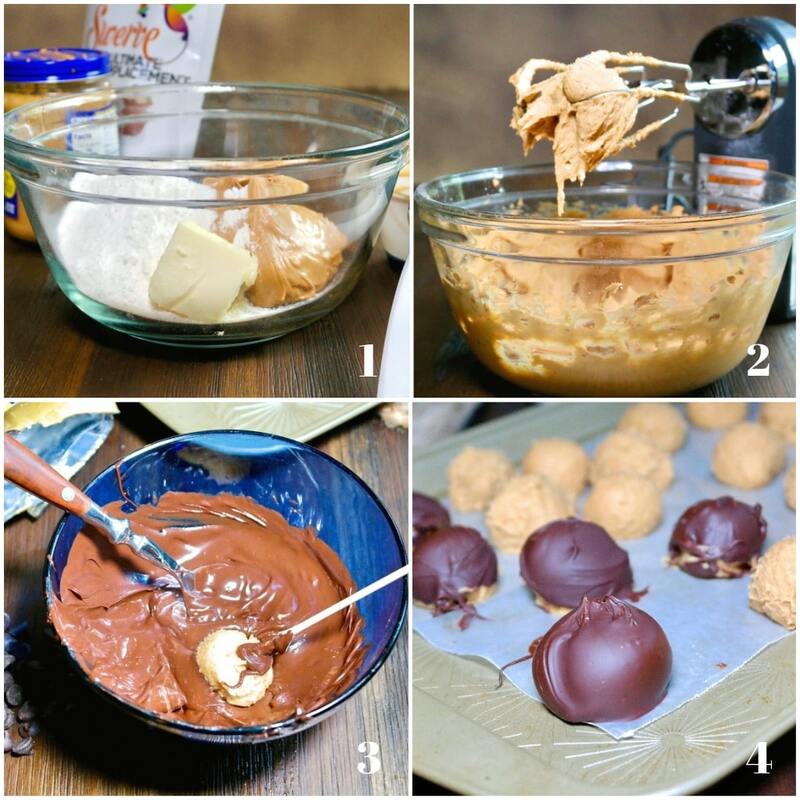 Melt sugar free chocolate and dip peanut butter balls in the chocolate. Place on a wire baking rack and sprinkle with sea salt. Let the chocolate balls harden. Store in air tight container in the refrigerator or the freezer. Want a sweet treat? Grab a fat bomb – just one will do the trick. Try these keto treats too! Keto Breakfast Cookies – nutritious portable breakfast cookies for on the go. Peanut Butter Eggs – sugar free chocolate and peanut butter eggs. Sugar Free Lemon Curd – rich and delicious with just the right amount of sugar-free sweetness followed by a zesty punch of flavor. 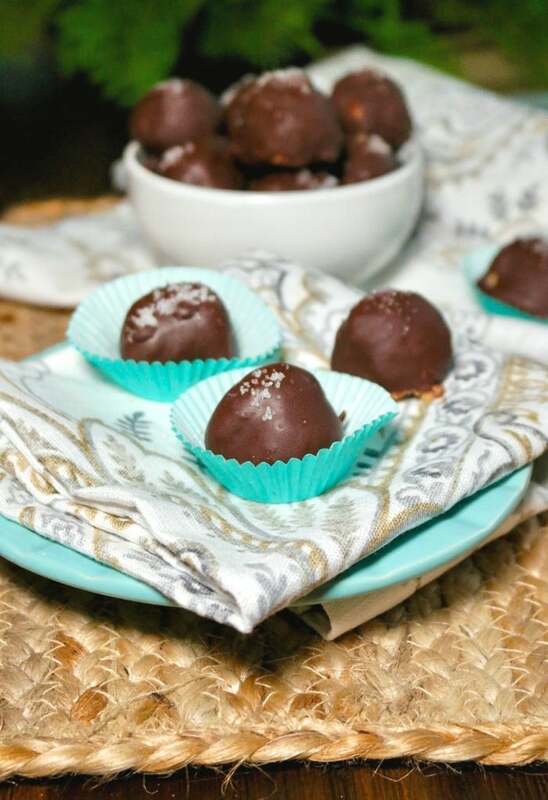 These no bake fat bombs will keep your sweet tooth under control by giving you a satisfying and filling low carb chocolate and peanut butter treat. In a medium mixing bowl, combine sugar alternative, peanut butter and butter; mix well. Shape into 1-inch balls and place on a waxed or parchment paper lined cookie sheet. Chill for a minimum of 30 minutes or place in the freezer until firm. Melt the chocolate chips in a microwave safe bowl (defrost at 30 second increments) until smooth. 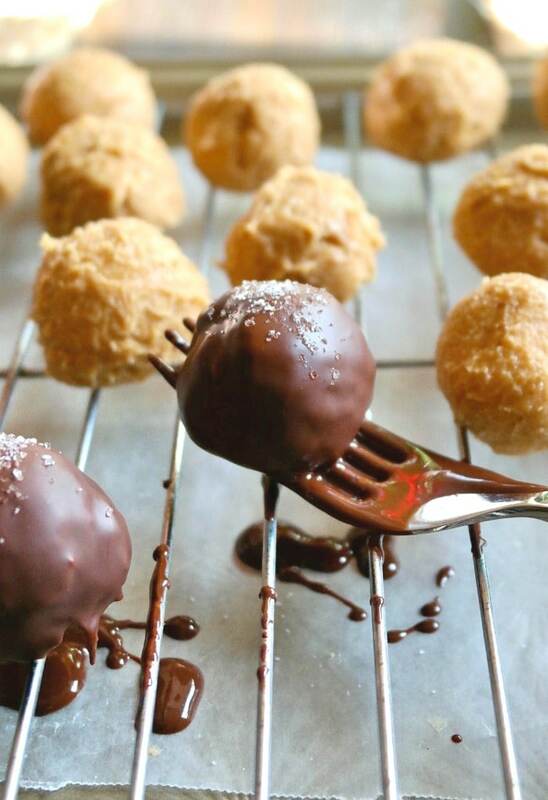 Dip peanut butter balls and place on lined cookie sheet, then sprinkle with sea salt. Let sit until the coating hardens. Place in an air tight container and keep in the refrigerator or freezer. Enjoy! Each brand of natural peanut butter has a different consistency. If you find that your peanut butter is too soft to roll in a ball, add up to 1 tablespoon of coconut flour. This will firm up the dough. Each fat bomb is approximately 7 carbs and 7-8 grams of fat. I did not use all the chocolate, so it is difficult to calculate. What perfect timing! 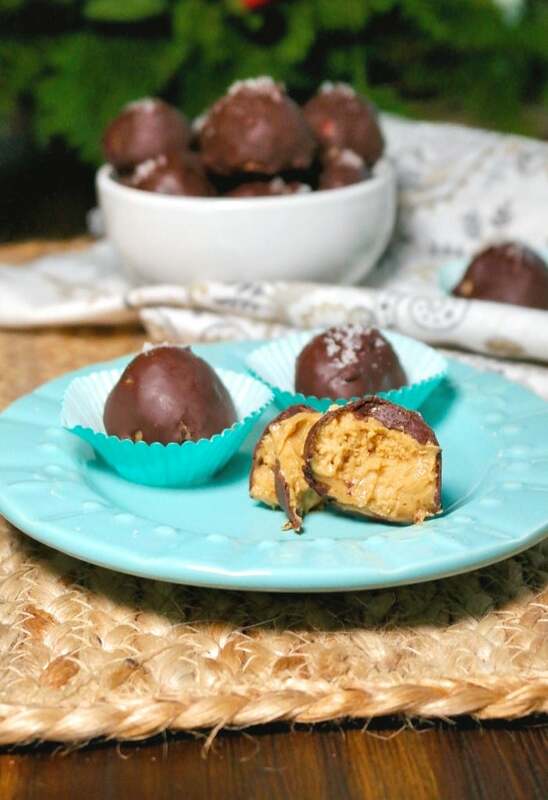 I have just been on the look-out for a new keto sweet treat to try and here I am looking at these amazing chocolate peanut butter fat bombs! Yes, please! I keep these fat bombs stashed in the freezer. It sure is handy to have and I’m less likely to grab those other tempting snacks that we have around! Yay! Adding these keto fat bombs are a great way to increase fats in your diet. 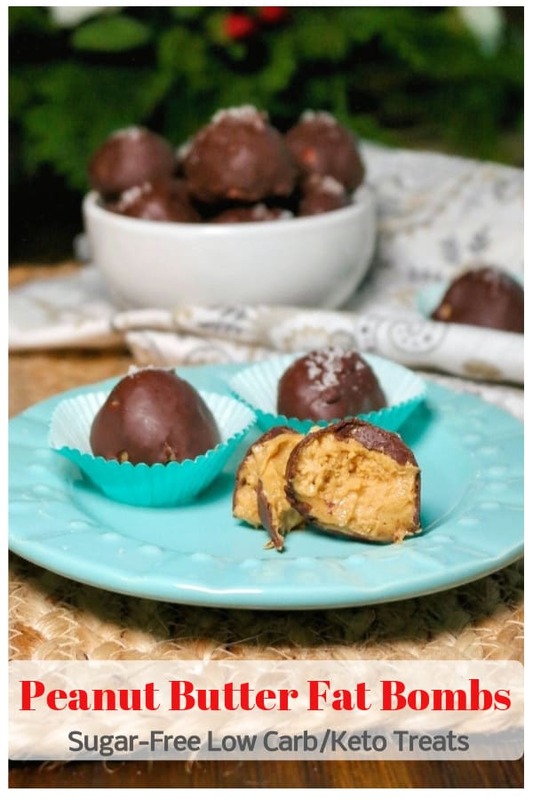 The Peanutbutter Fat Bombs sound wonderful. Hi Kelly, I didn’t provide the carbs because I didn’t use all the chocolate in the recipe, but I’m estimating about 7 carbs per fat bomb and the same for fat. Hope that helps. You can use a recipe analyzer like My Fitness Pal for all the macronutrients by inputting the exact brands of ingredients you use.